One more person has been lynched in Tripura on Thursday, this time in Kalachera area under Subroom Sub-division in the extreme south of the State, bordering Bangladesh. 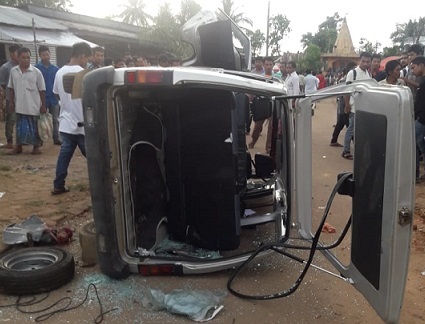 The fresh lynching incident took place in the afternoon when two persons on behalf of the district administration started announcing with loudspeakers in Kalacherra area of Sabroom to alert the people about rumour mongering. But suddenly a violent mob attacked them. In the attack of the violent mob, the announcer Sukanta Chakraborty of Manikghar under Sabroom Police Station was killed on the spot while the driver of the vehicle was severely beaten up. This is the second incident of lynching on Thursday. Earlier in the day, a vendor from Uttar Pradesh, Zahir Khan, was lynched in West Tripura and three others were seriously injured in mob attack, police said. All these attacks are the result of panic created across the State after rumours spread that a group of organised child-lifters has entered the State which the State Government and the State Director General of Police (DGP) categorically denied and appealed to the people to stop spreading and believing in such rumours. In the meantime, the internet service has been suspended in Tripura for 48 hours to stop spreading of rumours through the social media.